Why do coated lenses look purple (or blue or green or whatever)? Lens coating has NO COLOR. It is a water-clear material throughout the visible spectrum. It has only 2 meaningful characteristics that make it appear colored: (1) Refractive Index, and (2) Thickness. To understand why coated lenses look colored, you have to understand what the coating is there for, and how it works. The purpose of coating on a lens is to reduce reflections from the lens’ surface. Light reflects from the surface of the glass because the refractive index of the glass is different from that of the air, and the reflection is formed at this interface of different refractive indices. Light (for the purpose of this discussion at any rate) behaves as a wave: when a light wave strikes the glass surface, some of it bounces off as a reflection – the reflected ray still has the same wave characteristics as the incident ray, just moving in the opposite direction. This reflection has no apparent color, it reflects all wavelengths equally and has a greyish or silver appearance. Because the reflection is a wave, though, it has an important characteristic: it can be cancelled out by another wave, if that other wave can be made to be of equal frequency, direction and magnitude and opposite phase. In the sketch above, you can see that a second wave spaced 1/2 wavelength out of phase would have its highest point aligned with our wave’s lowest point; if this can be made to happen, the 2 waves will cancel each other out. It turns out that we CAN make this happen. What we need to do is to create a second reflection, in a slightly different location from the glass surface that created the first. In order to space the 2 reflections exactly 1/2 wavelength apart, the 2 reflective surfaces need to be spaced 1/4 wavelength apart: 1/4 wavelength for the incident wave going in plus 1/4 wavelength for its reflection coming back out = 1/2 wavelength. For this reason, antireflective coatings are sometimes referred to as “Quarter Wave” coatings. Remember, though, that the reflection occurs where there is a difference in refractive index from one material to the next. So not just any coating material will work; if the coating has the same refractive index as glass (about 1.6), there will be no “red” reflection, only the blue one – and there will be no anti-reflective effect, the lens will behave just as if it was uncoated. Similarly, if the coating had the refractive index of air (1.0), there would be no “blue” reflection and the lens would appear to be uncoated. In order to make the red and blue reflections equal so that they can cancel each other out, the refractive index of the coating needs to be about halfway between that of glass and air so that the difference at each interface will be equal. The perfect single coating material would therefore have a refractive index of about 1.3. The material most commonly used for this purpose, Magnesium Fluoride, has a refractive index of about 1.37 – not a bad compromise, considering that it offers durability and other desirable properties. Okay, great, I get it. But why the color? As you can see in the diagram above, for any given wavelength it should be possible to obtain nearly 100% cancellation of reflections by means of applying a 1/4 wavelength-thick layer of Magnesium Fluoride to the surface of the glass. But the trick is, 1/4 of WHAT wavelength? 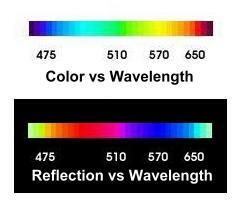 Light isn’t all one wavelength, there’s a different wavelength for every color from 400nm (violet) to 700nm (red). No thickness of coating can be 1/4 wavelength of ALL of them…. so the designer has to choose. Typically, they choose a wavelength that’s close to the center of the visible spectrum, so that the beneficial effects of the coating will be as uniformly distributed over the visible range as possible. The visible range being 400-700nm, the wavelength generally chosen as the target was in the neighborhood of 550nm, or right in the center. As you can see in the top chart above, the mathematical center of the visible spectrum, 550nm, corresponds to a color in the yellow-green range. A coating of 137.5nm thickness (550 divided by 4) would virtually eliminate any reflections of this color from the surface of the lens. It would reduce reflections of other wavelengths also, but the efficiency of its effect would become progressively lower as the wavelength deviates from 550. The net result is that the overall goal of suppressing reflections is achieved, but it is not achieved equally for all colors. We see this when we look at the reflections from the coated glass surface: there is no green light reflected at all, but there are reflections of the other colors. The overall effect is that of a reflection in the complement of the targeted color. These complements are shown in the lower chart in the figure above – 550nm corresponds to a blue-violet color ….. exactly what we see in a coated lens. So, if coated lenses are purple, won’t my photos have a purple tint? No…. actually, they’ll have a slight yellow-green tint – the extra light that didn’t get reflected passes on through to the film, and there’s a little more of the 550nm yellow-green than there is of the other colors. But it’s not very much – glass only reflects about 4% of light from each surface to begin with, and the coating has some effect at all wavelengths – so there’s maybe a couple of percent of extra green light getting to the film. For most normal photography, this isn’t enough to be noticeable in the pictures. However, some lens makers were concerned about it, and did something to reduce the risk of off-color photos. Every lens has at least two reflective surfaces, the front and the back. In lenses used for practical photography, there are generally at least six, and there can be 18 or more in complex wide angles or zooms. Each surface presents an opportunity to adjust the color effect of the coating: with, say, six surfaces to coat, the designer can specify six slightly different thicknesses of coating, each corresponding to a different point in the spectrum. If one surface transmits a little extra yellow-green, another a little extra blue-green, a third a little extra orange and so on, the total lens can be balanced to pass a very neutral color of light through to the film. This is why, in some lenses, you will see a number of reflections in different colors: each coating layer is the same Magnesium Fluoride material, each is a single layer, but each is a slightly different thickness to correspond to a different color within the visible spectrum to optimize balance. Not all designers did this – some felt it was better to optimize the entire lens in the center of the spectrum for best overall efficiency, and their lenses tend to have a uniform blue-violet color on every surface. So, what’s the difference between “single” and “multi” coating? Multicoating is significantly more efficient, and slower and more expensive to achieve, than single coating, but the principles and the basic process are the same. The basic difference comes down to refractive index. A single coating must have a refractive index about halfway between those of glass and air, and it took a number of years to find a suitable material in Magnesium Fluoride. To apply multiple coatings with similar effect, they must be of materials with an even progression of refractive indices, calculated to correspond to the number of layers desired. For example, if you want to apply 5 layers, you would need 5 different materials with indices of roughly 1.1, 1.2, 1.3, 1.4 and 1.5 to span the range between air (1.0) and glass (1.6). From here on, the process is the same as with the single coating, except that each layer is made a slightly different thickness from the others, with the thicknesses selected to correspond to several different wavelengths within the visible spectrum so that the suppressive effect applies not only at the 550nm center but across the whole range. A multi-coated lens does not appear as strongly colored as a single coated lens – its general tendency is to appear black by comparison to the blue-violet single coated or silver-grey uncoated lens. This is by design: the purpose of coating is to suppress reflections, and the purpose of multi-coating is to suppress ALL reflections. So if I see reflections of multiple colors in a lens, that doesn’t mean it’s multi-coated? Not necessarily. A multi-coated lens may present multi-colored reflections, but so will many single coated lenses. The way to tell a multi-coated lens from a single one is to compare the brightness of the reflections rather than their color: the lens with brighter reflections will be the single coated one. How much better is multi-coating than single coating? The difference between single- and multi-coating is not as great as that between an uncoated and a single coated lens; the single layer of coating deals with the majority of the reflections, and multi-coating is a refinement to further improve its effectiveness. However, the difference becomes significant when there are a large number of reflective surfaces in the lens. In complex wide angles and zooms, the multi-coated lens will perform significantly better than the single coated equivalent. It could be said that the difference between a coated and an uncoated lens in a simple design such as a Tessar is comparable to the difference between a single- and a multi-coated lens in a zoom. There are also, of course, different degrees of multi-coating with different levels of effectiveness: the more layers there are and the more different wavelengths can be optimized, the better the performance of the multi-coating will be. One last, unrelated question: Does coating make a lens “color-corrected”? No. Color correction is a function of the optical design of the lens, and is not affected in any way by coating. Color correction is the property of a lens that causes all colors to focus at the same point, and it is accomplished to varying degrees in both coated and uncoated lenses. It is important to both color and black & white photography, as a poorly color corrected lens will not render critically sharp images in black & white – but it is more visible in a color image, because poor color correction can be seen in the form of red and blue fringes at white/black interfaces in the color image. Early coated lenses were often named “Color” somethingorother, and coated lenses are generally to be preferred over uncoated ones for color work. The overall effect of coating on a lens is to decrease flare and thereby increase contrast in the image. The effect of flare and low contrast in a color image is to render the colors as pastels (this decrease in contrast can actually be desirable in some applications such as portraits, so uncoated lenses should not be totally discounted for color work; but in general, when shooting in color we like to see bright colors and higher contrast). In a black & white image, contrast is easily increased in printing and is not of great concern. In color it becomes more difficult, and in direct reversal color transparencies it is impossible to increase contrast after the image is made.